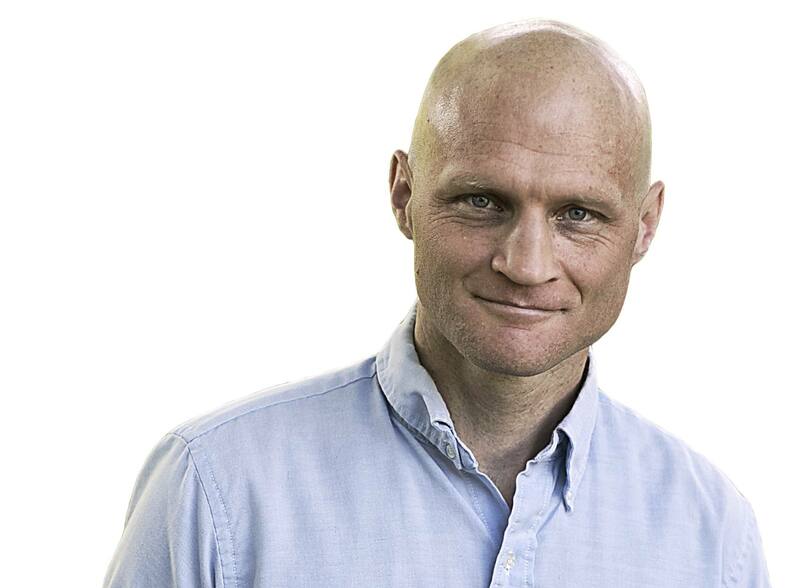 Scott Dikkers has spent the last three decades developing his brands. He began with a comic strip in the ’80s that became nationally recognized, and eventually took The Onion from a regional (and broke) college comedy newspaper to a beloved comedy institution read by millions every year. But how did he become such a success, and why is Dikkers being invited to so many marketing summits to be a keynote speaker? In Outrageous Marketing, which debuted as a no.1 seller on Amazon this week, Dikkers tells the story of his many years at The Onion, and how the lessons he learned over the years can be applied to marketers as a whole. Oneupweb CEO Fernando Meza sat down to talk to Mr. Dikkers to discuss the ins and outs of marketing, brand building and developing goodwill for yourself or clients, which can be leveraged into a memorable, or even unforgettable presence. I should say, I have a huge list of books that I want to write. Every time I come up with something, it’s like, “Oh, that could be a book.” I put it on a list, so it’s a long list. This had not been on there. The idea of telling the story of The Onion was something that I had been bugging a friend of mine, who’s a journalist who used to work at The Onion and has done a good job of saving remembrances and dates and facts and probably has journal entries. I was always pushing him to write a book that was like one of those many books they put out about Saturday Night Live. He put together a proposal and talked to an agent about it, and the agent was like, “Eh, sounds like a magazine article to me.” Then I started talking at these marketing conferences, which is so strange to me, because like you said, I’m a creative. I’ve really never done professional marketing, I don’t know anything about sales, but they invited me to speak at one of these things. I told the story of The Onion and I realized that people in marketing were really interested in that because obviously The Onion builds this huge brand, and we never had a marketing budget, and so, I must know something. They thought it was interesting and valuable, and they invited me back to other conferences like that. I figured, “You know what, I should put this in a book. Instead of telling my personal experience with The Onion as a story, I’ll frame it as a marketing book,” because I had done one other nonfiction book, “How to Write Funny,” that was surprisingly successful for me. I really had no idea how that book would take off. It’s been amazing. That is so odd to me, that transition that you have to make where for so long you’re just doing your craft, and then you lift your head up, and then you’re surrounded by people that are asking you questions and want to hear you say what you have to say about the thing that you do. I personally struggle with that because my first question is why? Why the hell do you care? That’s what you want to ask the people asking you? Yeah, me too. It’s like, you don’t realize. I was talking to Weird Al Yankovic about this. He just laughed, because it’s like, “You’re just making goofy songs, and then all of a sudden,” like you said, “You poke your head up and you’re like the elder statesman of parody.” Time does weird things to people. It waits for none of us, and now there’s all these people who are in their 30s, they’re professionals, and they grew up reading The Onion. It’s like an institution. I just have a hard time thinking of it like that. To me, it’s just this goofy comedy project that I obsessed about for a long time. I remember the ONN Network, and that was the first time I’d ever seen anything like that. I just didn’t know that you could do something like that. For me, it was very, I don’t know, groundbreaking. That’s so cool. I’m delighted to hear you say that, because that was a big risk for us, the ONN. The chance of that succeeding were pretty small, but I had a really specific idea of how I wanted it to be. I didn’t want it to be like Colbert or Stewart, where there’s a comedian laughing along with these funny fake news jokes. I wanted it to seem real, kind of like The Onion was, but just in video format. It took a ton of work. We had to hire this huge new staff to make it happen. We invested so much money in those movies. See, this would’ve never happened under the new system of The Onion where the money people have to chime in, because we’ve invested a couple million dollars in those videos over a period of months. Each video was in the neighborhood of $25,000 to make. At that time, you could barely make $500 with an ad for a video online. Well, you know what’s interesting about what you said there earlier, I feel like the challenge was the medium. Then here you are putting this content online, and that was, in my opinion, the beginning of what for me validated where the future was going to go. That’s interesting. Yeah, no, I think the medium is huge. The Onion has always forged new media. We were the first comedy newspaper, and as soon as podcasting became a thing you could do, we put our Onion Radio news show in a podcast. As soon as you could online, we put our newspaper online and we were the first humor website. People were starting to do video clips, but it took forever to download them, and there was competition between Windows Media Player and RealPlayer and QuickTime. You could never get it to play, and so many people had dial-up modems. The only thing that you were seeing was clips from news networks. The Onion was a fake newspaper, so it just made total sense to do a parody of the kind of news clips that were being offered on Fox News and stuff. When you’re the first one doing it, that’s just a huge leg up over the competition. I agree. As someone that has the benefit of being able to look back and offer a perspective, as you look at the different evolutions of The Onion, the different mediums that you’ve put your content on, what’s for you been the single thread that’s allowed you to stay true to yourself and become successful in what you do? 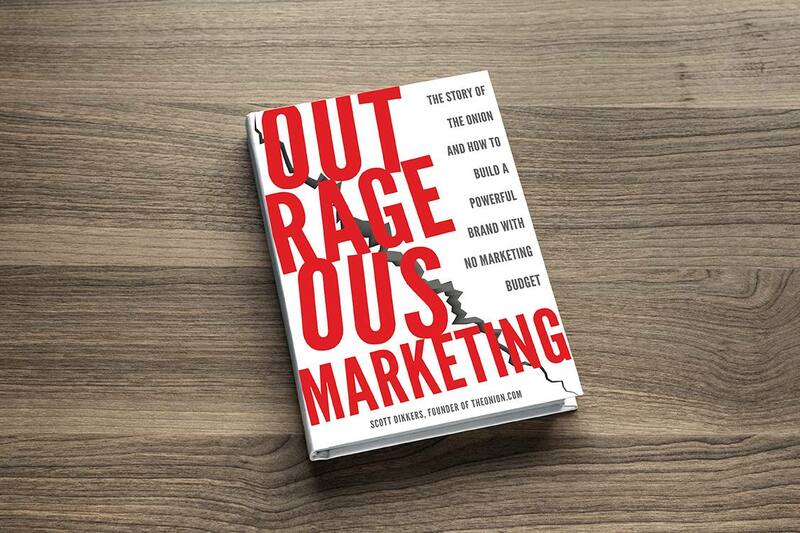 If I had to pick one, I would say it’s what this book is about, and it’s what I named Outrageous Marketing. I coined that term because it’s just a way of thinking about marketing that’s outside the box of working in a cubicle at a marketing job. It’s like, where your life is marketing, your life is about getting attention and getting people to love you, and you’re motivated by deep emotional forces and not just a desire to make money or sell a product. Do you feel like following your creative vision is the best way for marketers to go? I put a lot of examples in the book about when it worked and when it didn’t work, and trying to parse out why, because it isn’t really just about following your vision and your heart. I do think that’s important, but you have to do it wisely, and you have to have some sense that there’s a profit model in what you’re doing. If your passion is to paint black light posters of dolphins, you’re never going to make money at that, no matter how hard you work at it. You’re technically not a marketer, but are you not an authority if you release a book on Outrageous Marketing? Two-part question: who is this book for, and with that said, how can marketers use these lessons in order to elevate the brands that they’ve been hired to elevate? Is that even possible, if you’re not emotionally attached? Yeah, totally. First of all, the audience for the book is anyone interested in cool and refreshing new inspiration when it comes to marketing, and also anyone who’s interested in the story of The Onion. It’s kind of a two-tiered approach that I have there to appeal to readers, but as far as, yeah, you’re hired to do marketing for a brand, either a brand that’s trying to find its voice or a brand that really knows its voice and you’re hired to do it, this is a totally applicable idea. I’ll give you a couple of examples. Apple is a company that does this. Steve Jobs is a guy whose love for creating the future literally killed him. The theory is, and I buy this, that all that time he spent as a young person in the computer factory, he was around all these carcinogens and he got cancer. His diet of an apple a day probably kept him alive longer than if he had eaten a traditional diet. A lot of people think his diet is what killed him. He was incredibly passionate about that, he loved that, it was his life’s mission, and that’s kind of what Outrageous Marketing is. Find your mission, and then live out the most outrageous version of that. Doing marketing with no budget means … There’s a word for this kind of marketing, you guys probably know what it is. I heard it at one of these conferences, but I forgot, where your product is just so f*cking great that everybody’s talking about it. That’s a huge part of it. When you’re living the most outrageous version of yourself and your brand, you’re typically going to be doing something great and people are going to talk about it. Another example on the more conservative end of the spectrum would be a company like Walgreens. Their brand is convenience, and they know this. They know that that’s their brand identity, they’ve had it a long time, they’re a very well-established brand, but they know how to do outrageous marketing because they live the most outrageous version of convenience that they can. If a Walgreens is located in the middle of a street and a spot opens up two doors down in a more convenient location, they’ll move because they know that it’s all about convenience, and that’s outrageous. They pioneered the idea of home delivery of pharmaceuticals which, again, is convenient. Like, why didn’t anyone else think of that? You’re speaking of very singular entities. Apple was led by Steve Jobs. But when people hire out a third party to guide that voice it’s a bit different. Will those challenges be addressed in the book as well? The book isn’t really about actionable how-to steps or anything. It’s more of a broadly inspirational look at how this is done. But just to answer your question, if somebody doesn’t know what their brand identity is, the example laid out in the book is that you need to find it. The Onion explored, and it had the freedom to do so. If a company is hiring a marketing firm to do their marketing for them, they’re exploring, and that marketing firm, if they’re going to use the principles of Outrageous Marketing, are going to be brainstorming ideas about who this company is and what their brand is and what their identity is, and then trying to accentuate and heighten that to the utmost degree. If it works and if it sticks, that brand would be wise to continue using that approach. A lot of brands switch their identity around or they evolve, and they change. I guess that works for some people, and it can, as long as you’re succeeding then I’m all for that. I think that’s, the way The Onion succeeded was, it was kind of an open-ended evolutionary process where you follow what’s working. Oftentimes, we’re coming into a situation in which we’ve been hired to do one thing, but then before we even start to do that one thing, let’s just say it’s a website redesign, the first types of question that we try to answer are, “Who are you, what’s your tonality, how do you want to perceived? This website that you have hasn’t been touched in 10 years. You don’t simply just want to take that content over without running it through this new filter that we are going to develop for you.” We’re helping companies that are very traditional, and haven’t really thought about this ever, to take this leap of faith in their eyes. What’s helpful for us is being able to point to a time where we’ve been successful. How did you know? When were you getting validating when you were going in these new directions? When did you know that you were going on the right path? Yeah, so, I’ve had a few different successes. I’ve had many more failures, and I go through most of my successes in the book. I don’t waste time on too many of the failures, some, but my first was with a comic strip. I had done a bunch of different comic strip ideas that didn’t go anywhere. The one that hit, I knew it because people were responding positively to it. It was that simple. Marketing obviously is the same as entertainment in that way. It only works if it has an audience and if people like it. It’s not art. I get into that strange, gray line that I feel exists between art and entertainment and marketing, because they’re kind of blurred in my mind. That comic strip became my identity for a long time because it got to be really popular and clearly was taking off. Then, it actually led to my involvement in The Onion, which took about, I would say, five or 10 years before we really found our voice at The Onion. You knew because the growth just started happening exponentially. When we went online, that voice was pretty well-honed. The response was really immediate and overwhelming. We got so much attention in the media. We put out a book that debuted at number one on Amazon and number one New York Times Best Seller List. When those things started happening, you know you’ve found your voice. Then it happened again for me a few years later when I did a podcast that I have a chapter on in the book, where it was a parody of the President’s weekly radio address. It was this minor little side project, but it got to be really popular and it eclipsed the President’s actual weekly radio address, which was a thing Presidents used to do. It led to a big book deal and it was very successful. I look back on those three things and I see the pattern of how I applied these Outrageous Marketing principles of finding my voice and trying to be the most outrageous version of that voice. When I say voice, I’m talking about character. Character is one of the funny filters in my book, “How to Write Funny.” People love other people. That’s one thing we know about human beings. They love characters. In comedy, they love characters that are simply drawn with just one or two really clear traits. There are certain character archetypes that people love and will come back to over and over again. For me, thinking of a brand as a character archetype is incredibly helpful. I’ll throw another company out there as an example, Disney. Disney, their character is like the kindly uncle storyteller, the family-friendly storyteller. They started telling family-friendly stories in the ’20s and kept doing it with so much passion. Walt Disney is just like me in that regard. He’s putting all his money, all his time, all his passion into creating great entertainment for general audiences. That’s what he wants to do. His brother Roy is constantly trying to get more loans from more banks to keep them going. They keep winning Academy Awards and they get all this adulation, but they don’t start making money until, like, the ’50s when they’d finally built up enough goodwill and they’d built this brand that everyone gets. Then their growth starts happening exponentially, and pretty soon they’re literally the number one company on the Fortune 500 for many years. I used to work for the Mouse on the peripheral, they would outsource a lot of work to our agency. They were always very clear on what their brand was. Whether you were working at Disney Channel, ABC, ABC Studios, everyone was always very clear on what their mission was. You could see that they were so good at distilling it in a simple line or two, that was the commonality, that was the thread that connected everything together. Yeah. It’s like doing improv and being on stage and knowing your character. You have to know who you are, or you’re not going to get laughs. You have to know what archetype you are. Are you the ditsy college student? Are you the angry housewife? Whatever. I knew that my comic strip character was the introspective everyman. I knew that The Onion was the bumbling authority. My podcast, the character of the President, he was also a bumbling authority. I love the bumbling authority archetype. It’s my favorite archetype. It works great for comedy. The best improvisers are the ones who really accentuate and heighten those traits that make up that character, the same with brands when they’re marketing. If they really get it, like you’re saying, Disney had it honed to a sharp edge, Steve Jobs knew what Apple’s identity was, Walgreens knows what their identity is. I do feel like that’s how you succeed. That’s how you get through to people, that’s how you communicate to them who you are and what you are. If people are interested in that, where else are they going to go? They’re going to go to you because you’re the best. Yeah, I agree with that. I especially feel like that’s the trend where people exercise their commerce vote, they have some expectations of these brands, because that’s their identity. They want to attach their identity to brands that they feel connected to. Yeah, it’s like choosing your friends, who you hang around with. You want to hang around with cool people that you want to be like. I hope it’s a general sense of inspiration and a fresh new way of thinking broadly about what marketing is, and by doing so, understanding its power to connect with people. Yeah. You do not come at this from a cynical standpoint, I want to point out, or at least it doesn’t seem like it. Not at all. For me, it’s a very personal story. People in comedy are often people who are lonely and don’t know how to connect with other people, they get bullied when they’re young, and they turn to comedy as a way to get attention and get people to love them and be their friend. Isn’t that exactly what marketers are trying to do? Do you want to talk marketing with Fernando? Contact Us!